Jack's PACT is proud to again have two teams of adults and youth running in this year;s 2017 Cape Cod Marathon Relay! We run together the 26.2 to raise funds and support for Jack's PACT and hope you will consider joining us on Friday, October 13th for a fun and spooky Paint Night! Grab a friend and head on over to our host, Longfellow Design Build's Main Street showroom, for a memorable night of painting for a purpose with great raffle items too! Julie Duffany, artist, teacher, and Jack's PACT marathon team member, will generously lead us in creating an autumn-themed canvas, while we sip responsibly, snack, and enjoy an evening out for a local cause. Find our Facebook event online by clicking here or RSVP below! Proceeds from the paint night will go directly towards Jack's PACT programming in Falmouth, Jack's PACT scholarships, as well as defraying the entry fee for BOTH Team JP Cape Cod Marathon Relay teams. Did you know Jack's PACT has had a marathon relay team in the CCM for the past two years? In the 2016 CCM, Team JP entered two teams for the first time; one being composed of Falmouth Public School Students ranging in age from 11-18! 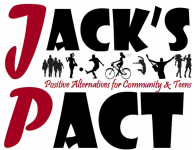 Events like this are important "positive alternatives" that also raise awareness and comraderie for Jack's PACT. RSVP & PAY TO RESERVE YOUR SEAT TODAY! Not interested in painting but still want to play?? Come to Longfellow Design Build Paint Night After Party  ! Stop by from 8-10 for $5 to sip and mingle responsibly, for a wonderful local cause. A few awesome Raffle items will be available, so cash is always welcome! Don't miss it!